When setting up a cluster to provide high availability for the Bizagi Work portal, you will need to ensure that you configure a load balancer to route requests to the different servers of your cluster. Bizagi recommends the use of a hardware-based load balancer such as f5, along with specific aspects for you to consider when configuring this load balancer. 1.The use of a “sticky” mechanism in f5 for the persistence profile, such as destination address affinity persistence. 2.The use of a load balancing algorithm in f5 which takes advantage of your servers as much as possible, such as the round robin method. Consider that through the steps listed below, you will simply set up the f5 load balancer. This means that you know which Bizagi servers you will be employing for a clustered setup (ideally you should have by now configured your Bizagi Work portal in all servers and activated applicable licenses). Follow these steps to configure both destination address affinity as the persistence profile, and a round robin algorithm in f5. 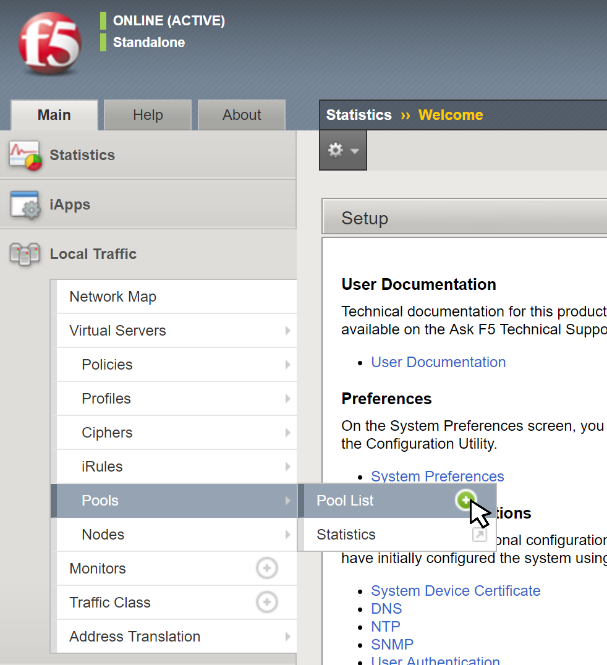 1.Browse into the Main tab of the f5 configuration and locate the Local traffic group. 2.Go into Pools and click the icon next to Pool list to add a new one. 3.Give a Name to the pool (plus a meaningful Description if you wish), and ensure you choose https as the Active protocol to involve in the Health Monitors configuration. 4.At this point you may also choose to set Round Robin as the Load balancing method (alternatively you may choose another method which best considers your servers capacity). 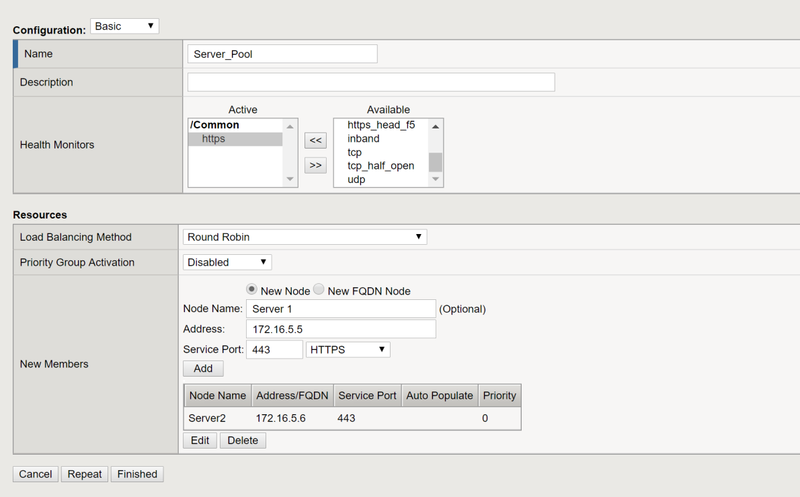 5.Use the New Node option to specify the Node Name and Address for each of the Bizagi servers making up your cluster. Ensure you set the Service port and protocol accordingly as well (i.e., 443, using HTTPS). 6.When done, click the Add button so that the server is registered as a node belonging to the actual pool and shown in the table below. Recall that you need to do steps #5 and #6 for each of the servers of your cluster so that in the end, you have them all registered and displayed in the table of Nodes. 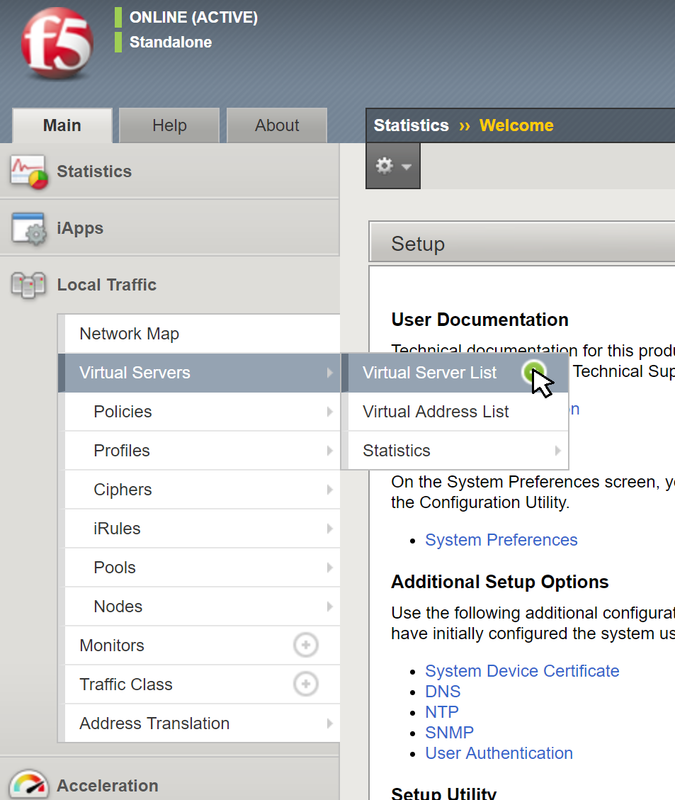 8.Back in the Main tab and Local traffic group, locate the Virtual Servers and click on the icon next to Virtual Server List to add a new one. 9.Give a Name to the virtual server (plus a meaningful Description if you wish), and ensure you specify: The Destination Address/Mask (IP as how you wish end users to target Bizagi) and the Service Port specs (port number and protocol; i.e., 443 using HTTPS). You may leave other settings with default values. 10.Next at the HTTP Profile configuration, ensure you select http for the HTTP Profile. 11.Ensure you select your corresponding SSL certificate for the SSL Profile (Client) configuration, and you may select serverssl as the one applicable to SSL Profile (Server) configuration. 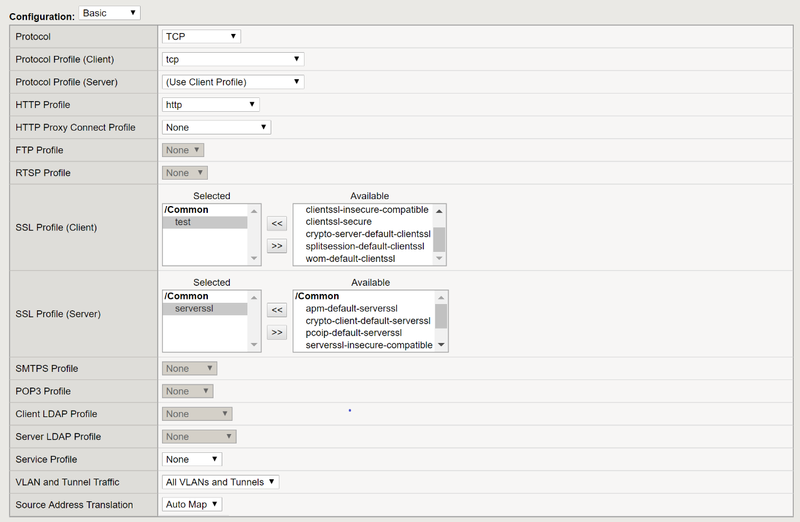 Choose Auto Map as the value for Source Address Translation. 12.For the Default Pool setting, ensure you select the pool you created previously (steps #3-5), and leave the default dest_addr option for the Default Persistence Profile. This guide seeks to illustrate those main aspects and requirements needed for an f5 load balancer to work with Bizagi (i.e., a “sticky” mechanism for persistence, and a load balancing method/algorithm which attempts to route requests as evenly as possible to all servers in a cluster), according to vendor’s best practices. This guide is not comprehensive as to illustrating all steps possibly needed for a f5 configuration or further tuning as per customer’s specific settings. Specific order of steps or user interfaces presented may vary according to the employed f5 version. For additional and complete f5 information, refer to f5’s official web site. •https://support.f5.com/kb/en-us/products/big-ip_ltm/manuals/product/ltm-concepts-11-5-0/5.html for load balancing methods and overall pool features and settings.